There are many types of Japanese landscape design. The Japanese Tea garden is the one most familiar. In the Japanese garden, the south is always considered the most suitable exposure for dwellings among Japanese, as the summer breeze generally prevails from this direction. This idea is so well observed in Japanese landscape garden construction that everyone adheres to the principle. In general, the composition of Japanese landscaping may be treated under two divisions: Flat Japanese garden landscapes (hiraniwa) and Hill Japanese garden landscapes (tsukiyama-niwa), both of which may be again subdivided into three different forms called, respectively, Finished, Intermediary and Rough. The Japanese landscape above represents an ordinary Hill Garden of the finished style, and may be taken as the best form suitable to spacious land, located in front of the principal building. The positions of the principal hills, stones, trees, cascades, bridges, and isles are all arranged in the landscape as shown in the image. Hill 1, which forms the central feature in the Japanese landscape, represents a mountain of considerable size, and should have broad sweeping sides. Hill 2, always taken in connection with No.1, is to be placed close by the latter, but is somewhat lower and consequently is of secondary importance. Hill 3, placed on the opposite side of No.1, occupies a part of the foreground. It is intended to represent a lower hill or spur divided from the principal mountain by a lowland. The lowland in the garden landscape is supposed to be occupied by a hamlet, road, or stream. It must be planted with a few trees or shrubs of thick foliage, so as to give an idea of a sheltered and inhabited dale. Hill 4 is a small eminence, generally disposed in the near foreground, which forms a part of the hillside. Hill 5 is placed in the farther end of the Japanese landscape, in such manner that one can have a view of it between Hills 1 and 2. As this hill is intended to look like a distant peak, it must be executed so as to have a precipitous appearance, while its bottom must be covered perfectly to give only a suggestion of foreground. 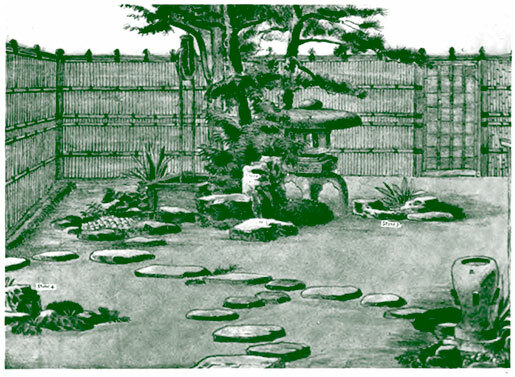 This is an example of a Japanese flat garden in the rough style where the landscape elements are simplified. The ground itself is reduced to a layer of fine earth. A well, lantern, trees and stones are featured in addition to a water basin and a drain, two groups of stones and a few stepping stones on a wide landscape space. The stone in the center is termed Guardian Stone while another stone is known as a Worshiping Stone or Honor Stone. The smaller group of ornaments in the eastern foreground of the Japanese flat landscape garden design share the area with a few stepping stones. The stones are somewhat rough in nature as no hewn stone is introduce in this style of Japanese garden. Two pines, shrubs and a group of low plants are all the vegetation required in the Japanese landscape plan. These, together with a few water plants serve to cover a rustic well. A large Snow stone lantern also forms a part of this group. In the corner of the foreground to the west are a water basin, drain, and a screen fence. A simple bamboo enclosure encircles the landscape area. There are several types of Japanese landscape stones. The Guardian Stone is a high stone and is placed in an upright position. It is situated in the center of the garden and is called the dedication stone. The Worshipping Stone is usually placed in the foreground of the Japanese landscape or sometimes on the center of an island or in an open space accessible by stepping stones. The combination of the Guardian Stone and the Worshipping Stone can never be omitted from a Japanese garden landscape. The Perfect View Stone is placed near the foreground of the garden or it can be located on a side of the landscape if it maintains a due prominence. A Japanese landscape will also feature two or more flat stones on the other side of the garden, placed as to be in harmony with a flat one termed Water Tray Stone. Both are situated on the shore of a lake and are carefully arranged in connection with the high water level. A Moon Shadow Stone occupies an important position in the distance, placed in the valley between two principal hills. The Cave Stone is upright and is very similar in use to the Guardian Stone for which it is sometimes substituted. The Seat of Honor Stone is broad and flat and placed in a horizontal position next to the Worshipping Stone. The Pedestal or Snail Stone occupies the first rank among the stepping stones and is arranged in the foreground. The Idle Stone consists of two broad low and somewhat round stones and is placed in the shade along the water. In general, Japanese landscape stones are arranged to produce harmony in a Japanese garden. Before giving a full account of the vegetation in Japanese gardens one must mention that a particularly noteworthy tree is always found among several others of less importance. The Principal Tree (Shojin-boku) is a pine or an oak well grown, accompanied by other trees with thick foliage. The Perfection Tree (Keiyo-boku) is only second in importance to the Principal Tree. Its trunk, branches, and foliage are objects of particular interest. The Tree of Solitude (Sekizen-boku) may be either single or grouped, but must always have thick foliage. It is intended to give shade and to impart a very secluded aspect to the Japanese garden. The Cascade Circuit (takigakoi) consists of a number of low trees or even bushes. They are planted around the waterfall in such a manner as to shelter the cascade from too much bold exposure to the eyes. The Setting Sun [Sekiyo-boku) is planted in the background of the Japanese landscape. The tree is planted to turn westward, and is intended to screen the garden from the rays of the setting sun. The tree best adapted for the purpose is generally maple, or, if this cannot be obtained, at least another red foliage tree should be procured that would produce a striking effect under the evening sunshine. They are sometimes replaced by the cherry and plum tree. The Perspective Pine [Mikosi-matsu) is designed to give an effect of extended distance and naturally is placed behind a garden or in a place partly concealed. The Outstretching Pine (Nagashi-matsu) suggests branches overhanging a stream or a lake. This is generally a single evergreen tree in the foreground with branches outstretching over a stream. Every Japanese landscape design must have a stone lantern. They add greatly to the composition of the space in connection with rocks, shrubs, trees, fences and water basins. 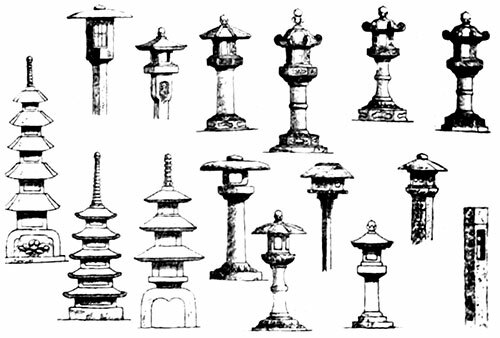 In introducing stone lanterns, however, strict principles of harmony in size and form must be observed, otherwise it would be detrimental to the effect of the garden itself. They are generally located at the foot of a hill, on an island, on the bank of a lake, by a well or a water basin. The use of the lantern is not to give light but serves only as an architectural ornament. Sometimes the lantern is lighted, but it is generally in a very limited extent. When the lantern is situated along the lake or by a stream, it can be lighted to produce an effect against the water. 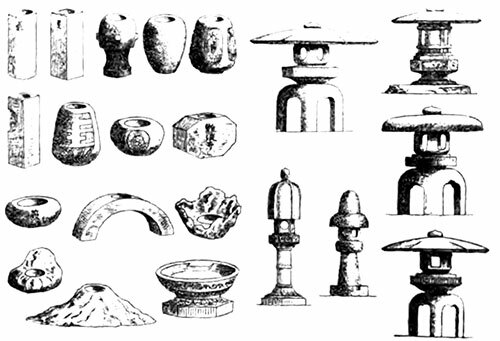 Featured are several designs of Japanese water basins and some more styles of stone lanterns. The proper use of a water basin is for washing the hands. They are usually placed near the veranda of a house. But water basins, with other accessories such as lanterns, bridges, etc., are intended to be an attraction in a Japanese landscape and, when placed beside ornamental hedges or concealed by foliage, are very attractive. 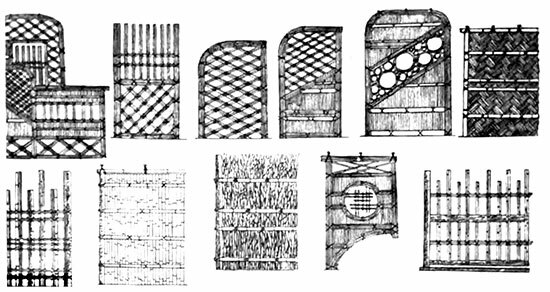 In a Japanese landscape plan you can find various forms of hedges and bamboo screens. Sometimes they serve as the boundary of the garden; on other occasions they serve to shelter obstacles, while in other cases they only serve as ornaments. The fences are arranged along water basins and are termed Sleeve Fences (sode-gaki). They are generally made of bamboo, held by wooden frames, twigs or branches. Japanese garden fences are intended to give a rustic aspect. Cords and knots, as used for force work, are always objects of high importance. Fibers of sago, fancifully colored, are found in a Japanese garden, although in many cases creepers are used. Every Japanese garden is provided with different forms of decorative entrances. 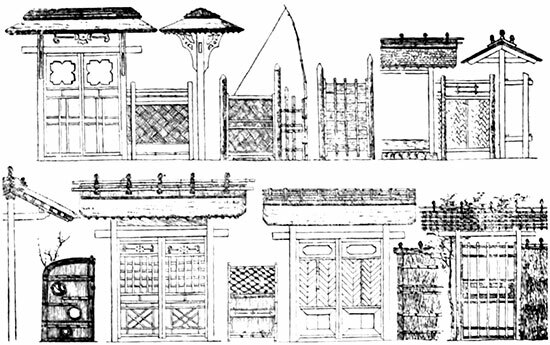 These forms of gates and gateways vary according to the size, style, and nature of the garden. The site of a gateway is always carefully chosen. 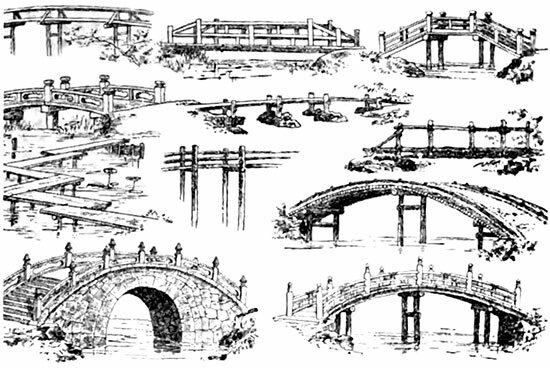 Japanese landscape gardens feature different styles of garden bridges. Some of them are made of stone, while others are formed by rock work with earth on them. The Japanese garden bridge is not intended to give a quick access over a water feature, but rather to add an attraction to the garden. A bridge also serves to allow a pleasant view of the pond and stream beneath to those who may stroll over it. 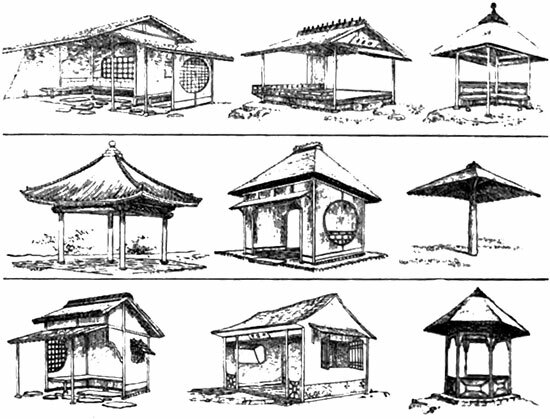 A large Japanese landscape frequently features a summer house or arbor, constructed on a hill or other eminence. A pleasant view of the garden can be enjoyed from a summer house. Different designs vary from the simple to a very artistic construction with floors, doors and windows. 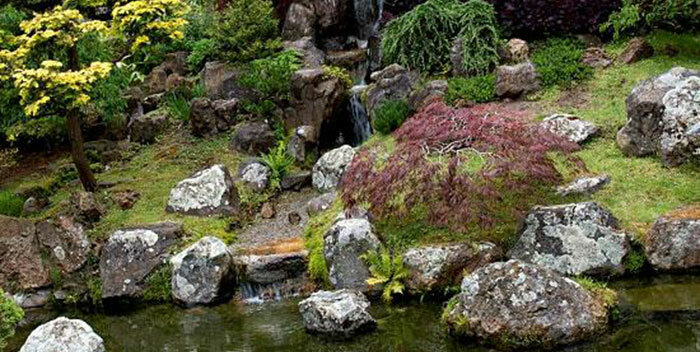 Now you can use online garden tools to create beautiful Japanese gardens. Landscape design software is vital in visualizing your Japanese landscape design before investing hard work and money. Free download trial versions of 3D landscape design software are offered featuring powerful 3D visuals. Place a photo of your property and landscape directly on top for a "before and after" photo-realistic effect.